A UK-based food truck operator is planning to bring the world’s most outrageous burger to Dubai, taking inspiration from the city’s iconic Burj Khalifa. 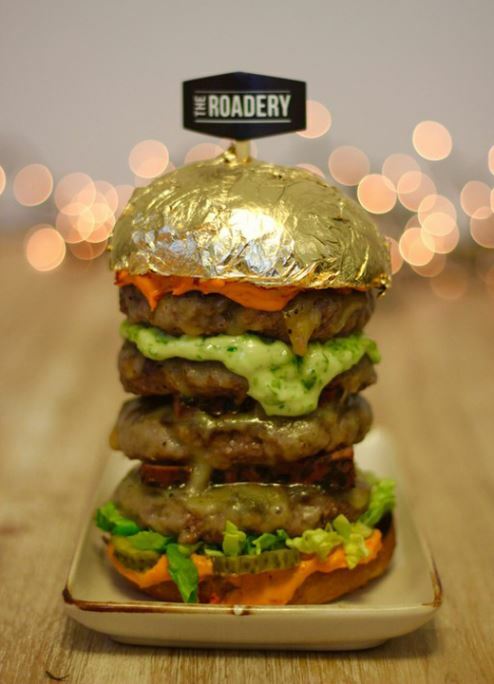 The Roadery has cooked up the towering ‘Burg-Khalifa’, which at AED230 (US$63), ranks among the world’s priciest burgers. The fast food staple, which is topped with 24-carat gold leaf, will be sold at Dubai’s upcoming food truck event, ‘Eat The World DXB’, which will take place at Burj Park from February 25 to 27. The Roadery is one of 25 international vendors set to park up outside the Burj Khalifa where visitors and residents are expected to flock to sample the latest in street food. The ‘Burg-Khalifa’ will have five layers of Wagyu beef patty, truffled cheese and seared fois gras – all topped with saffron mayonnaise and blackberry ketchup. The Roadery owner Dan Shearman said the company spent around four weeks developing the burger. “With its undisputed reputation for luxury and incredible ability to build almost anything bigger and better than the rest of the world, we couldn’t return to Eat The World DXB without something extra special this year,” Shearman said. He said the idea of creating a burger fit for a Sheikh was born in London and made exclusively for the UAE. "So we're extremely excited to be bringing it over to [the food truck event]. It's going to be one of the most expensive burgers in the region, and we promise you'll get more than your money's worth with the premium quality ingredients," Shearman added. Food trucks are becoming a more regular presence in the UAE, with vendors coming together at weekend events, dishing up a variety of cuisine to the country's growing band of street food fans. According to Euromonitor International, UAE residents spent AED52.4 billion ($14.27 billion) in 2015 at 16,200 food and beverage outlets around the country.